The Isle of Lewis chess set has become one of the most recognised and classic designs of chess piece today second only to Staunton. Behind these beautiful and unique chessmen is a fascinating story. 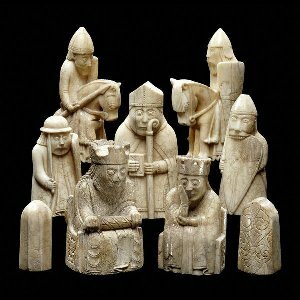 It is believed that the original Isle of Lewis chessmen were made in Norway in the 12th century but they didn’t find their way on the radar until the mid 1800s when they were accidentally discovered. The discovery took place in Scotland, on the Isle of Lewis. A local worker noticed that a sand bank had collapsed and went to take a look. He saw a partially buried chest which he quickly unearthed and opened. Inside the chest were the original chess pieces. The Lewis chessmen are the source of much debate, and indeed some fierce arguments. When the original discovery was made a total of 78 chess pieces were found inside the box, obviously more than is needed for a standard game of chess. Some have argued that the pieces were never intended to be used as chess pieces but for another ancient game instead. It is however generally agreed that they are chessmen, and if they were not originally, they certainly are now. It would seem that the person who made the originals was quite a forward thinker. By making 78 pieces instead of the usual 32 he has helped to smooth, although not eradicate, a continuing feud which relates to where in the world the originals will be kept. At present the full 78 pieces are split between various museums, but all remain in the United Kingdom which seems to somewhat annoy those who believe they should be returned to Norway, where they were made. Indeed those people seem quite irate about the name of the chessmen too. It’s fair to assume nothing will change in relation to the name and the whereabouts of the chess pieces. These days you can buy very good reproductions of the original chessmen, indeed thousands of sets have been produced around the world. The design of course if out of copyright, so sets can be produced by anyone. There is however one official set produced by the National Museum, Scotland. This set has been made from precise laser scans of the original pieces and is the closest you will find to the originals.